If you must work, Giselle Villa will make it painless. The villa has open interiors that will accommodate working in small or large groups. You can even hold your meetings on the covered patio to take advantage of the views, the trade winds, and the warmth of the sun. When it’s play time, there is a large infinity pool surrounded by cushioned chaise loungers that will put you in an island mood in a hurry. At the end of the day, everyone can relax on the patio over cocktails or take a glass of wine to the jacuzzi and watch the sun set over the Caribbean. Giselle is a magnificent Villa perched on a gentle hillside overlooking Plum Bay and the Anguillan Channel where the large cruise ships float by. Built in 2014, Giselle is located in Terres Basses, one of the few gated communities in the Caribbean featuring two-and-a half acre home sites. The community is gated as is the villa property. 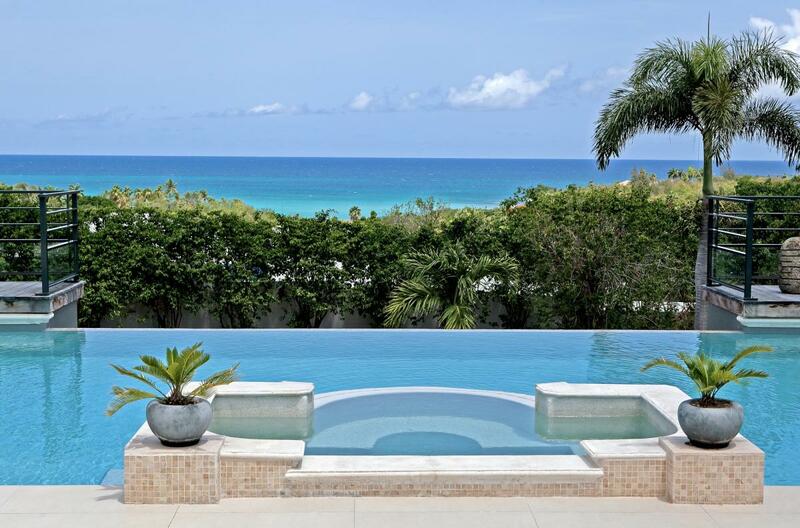 This superb, private home has a 180º view of the crystal blue waters of the Caribbean and it is only 6 minutes walk to Plum Bay beach. Giselle has four equally-sized master bedrooms with walk-in closets and bathrooms en suite; there is no disputing as to who gets the biggest or smallest bedroom or the one with the best view. All four of these king-sized bedrooms as well as the kitchen, dining room and lounge have a spectacular 180-degree view of the sea. There is also a fifth bedroom. The bedrooms are air-conditioned or you can enjoy the wonderful caribbean breeze. It seems there is always just enough breeze up here—one of the enormous advantages of being on a rolling hillside. Each bedroom/bath suite is like a separate cottage connected with a common roof and veranda opening into the pool and the terrace. As you enter the villa your view is across a wonderfully furnished lounge, through a 30-foot open doorway, across a sheltered veranda, a hot tub and a heated swimming pool. That’s right, heated, one of the very few on the island; you might need it if the temperature at night dips into the low 70’s. And the pool is large enough for some exercise if you are so inclined, or simply lounge by it and drink in the view. The kitchen opens up to the outside. The dining room is outside under roof. There is plenty of space so everyone can go off for his or her own peace and quiet or gather in one of the lounges or at the kitchen counter for conversation. The spacious indoor and outdoor living areas offer ideal opportunities for relaxing and entertaining, complete with the gourmet kitchen and covered outdoor dining area with gas BBQ. You can go to a different restaurant every night for a year and never repeat yourself, or on some nights you can hire a chef to prepare meals. There is a caterer nearby who delivers great meals prepared fresh daily as well (ask us for a referral). Connection to reality is maintained with a WiFi internet connection and a US telephone line. There is a local phone line. Plum Beach is a 5 minute walk from the villa. There is also good snorkeling at this beach. Free Night Stay PLUS free rental car! Valid on new bookings only. Cannot be combined with other specials. Free car covers the base rate of a Hyundai i10 or equal. Gas, insurance, and upgrades not included. Good for stays from Jun 1, 2019 to Nov 30, 2019.